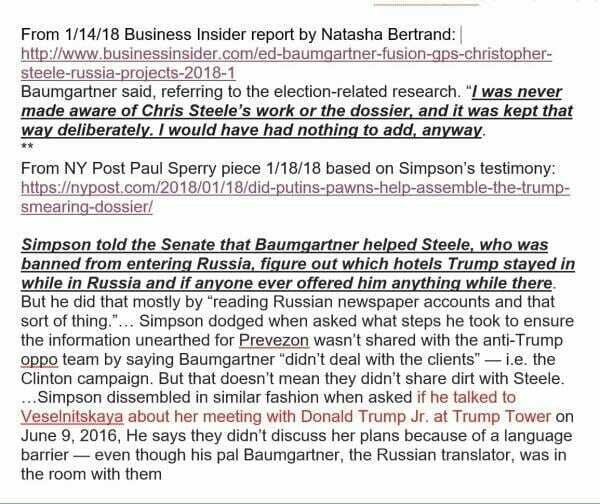 Baumgartner was with GlennSimpson at the meeting with Russian lawyer Velsenitskaya after she went to Trump Tower to see Donald Trump Jr.
Fusion GPS Russian expert Ed Baumgartner spoke with reporters in early January where he discussed his election-related research. But that is not what Glenn Simpson told Senate investigators about Baumgartner. …Simpson dissembled in similar fashion when asked if he talked to Veselnitskaya about her meeting with Donald Trump Jr. at Trump Tower on June 9, 2016, where she lobbied against Magnistky Act sanctions with a come-on about offering dirt on Clinton that never materialized.